The Patlock is an easy to fit security device for any patio or french doors. The best types of security device physically stop an attack and provide a visual deterrent. The British designed and developed Patlock does just that. Any homeowner can fit and remove the Patlock in a matter of seconds. There is no requirement for keys or number codes. Simply slide the two parts over the doors handles and thats it. And it is just as simple to release and remove. Restricting the movement of the both handles it will block the common means of entry. And although it is unobtrusive in its design the Patlock provides a visual deterrent. The office of national statistics reports that 70% of intruders gain access via a door. It is common place that these intruders choose doors that are out of the publics view. Making patio and french doors a prime target. Commonly constructed of uPVC, older patio doors have a common weakness. That is they use a euro cylinder lock that can be easily broken using a method known as lock snapping. Whether the lock is snapped, picked or drilled the Patlock won’t allow entry. So what if your door has multi-point locking? With a single mechanism controlling all locking points it is fine whilst the lock remains intact. The burglar, once he has broken a lock can activate that locking mechanism. Which guess what? Yes, releases all of the locking points. So what more can i do to make my home secure? The first thing to do is to understand if your home has any potential security risks. Some risks such as damaged or broken locks or door frames are fairly apparent. Other’s may not be so easily spotted by the everyday home owner. 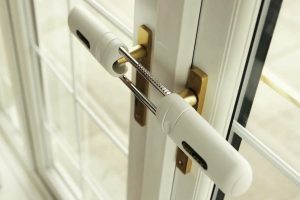 Motion Locks can help with a free no obligation home security survey. Whilst were there we may as well demonstrate the Patlock. MotionLocks are proud to supply this Great British innovation. Book a free home security survey and find out more about our services and our promotional Patlock offer.